Things to do, see, or eat around Edinburgh. Edinburgh has a great sense of community and one of the best places to experience this is at one of the city’s weekend markets. Filled with stalls offering local food and goods, the markets are a place of the people. From freshly baked breads and antiques to handmade crafts, the markets have a bounty to offer for both locals and tourists. Who: A variety of local producers and craftsmen. Check out their website below for a list of all the producers and who will be there on any given Saturday. What: Fresh fruit and veg, Meats/fish/dairy, Sweets and Baking, Knitwear and ready-made foods. When: Saturday, year round, between 9am & 2pm. 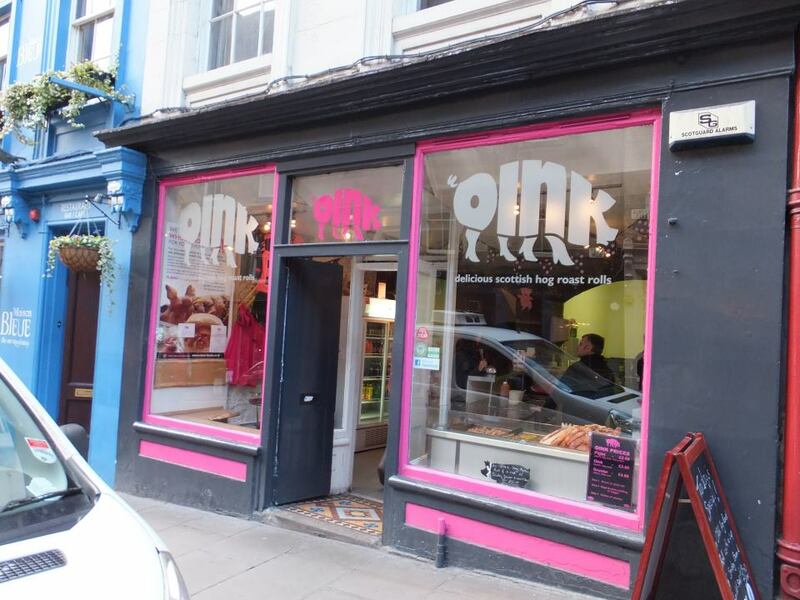 Why: Right in the city, this market is easily reachable on foot (with access through the grassmarket via some stairs off King’s Stables road and Prince’s Street) and parking is generous with both street and a paid NCP parking lot nearby. Opening times: Varies by season, see website for current hours. Attributes: Very competitive pricing, knowledgeable staff, beautiful old world decor. Advice: Make sure you find the real one. During tourist season (Summer) the shop gets busy and it’s not a large shop. 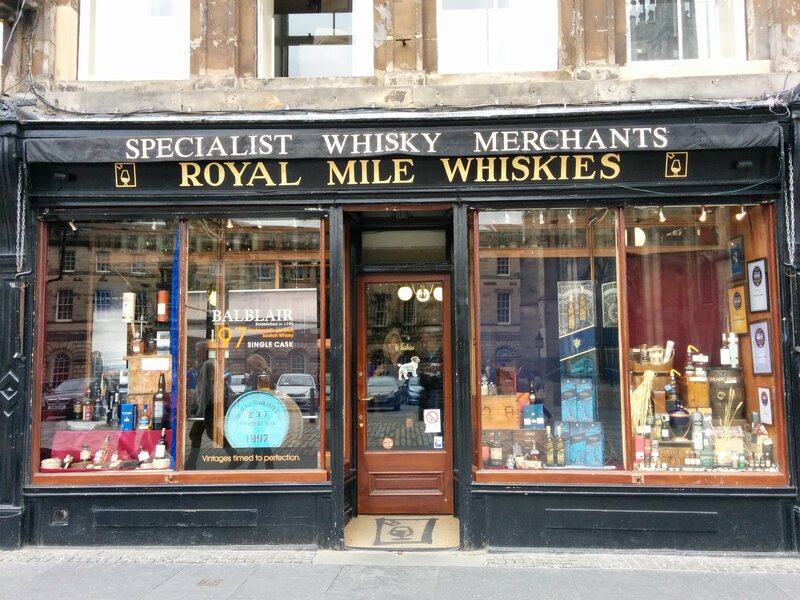 The one and only Royal Mile Whiskies shop! As the name would suggest it does indeed sit upon the Royal Mile (High Street) in Edinburgh (actually they have another location by the same name in London but this is the original). In fact it commands quite the location being opposite of St. Giles Cathedral which is on the more touristy side of North Bridge (the road that goes over the bridge with the stunning view of the Castle). The overall look of the place is almost too perfectly old world charm. Its wooden framed front windows featuring displays seemingly right out of “Martin Dressler: Tale of an American Dreamer” and victorian library interior scream tourist trap. Indeed that’s what I thought when I first came to Edinburgh. However, I could not have been more wrong about the place! I suspect other people have made the same mistake as I once did. What I later discovered is that RMW (Royal Mile Whiskies) is in fact one of the best places in Edinburgh to purchase whiskies. The reason being that they also have a sizeable online store with online competitive pricing and unlike some hybrid shops, their in-shop prices are the same as their online prices. So basically, it would be hard to find a shop with better average pricing than these merchants. They also carry an impressive range of rare bottlings for the thirsty millionaire to purchase or the curious average alcoholic to gander. I’m not well known for frequenting bars/pubs around Edinburgh. I usually prefer to drink at a tasting or the comfort of my home (just a lazy bum I guess) but I do go out occasionally when my friends urge me to join them. So I know a few good places around Edinburgh to grab a dram or pint. 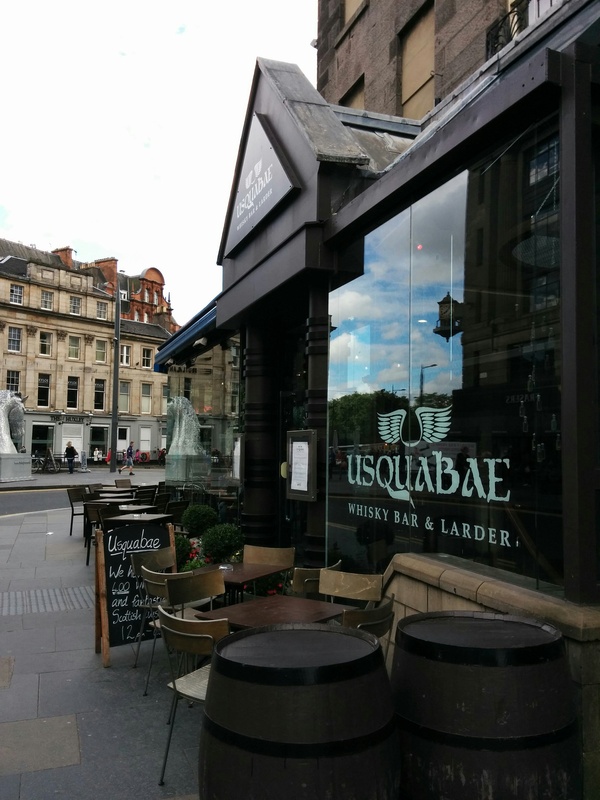 With that disclaimer out of the way, I was recently invited to the Opening Event for the Usquabae Whisky Bar and Larder located just on the west end of Princes Street. You can see a picture of the front at the top of the post. Ah Cadenhead’s. A truly remarkable shop. A truly remarkable bottler. WM Cadenhead is the oldest independent bottler in Scotland. Hailing back to 1842. That’s a long time ago. Cadenhead’s is currently owned by J & A Mitchell & Co (the same family who own Springbank), which means they still have that traditional feel. While bottlings from Cadenhead’s can be found at many specialist whisky shops, the best place to find them is at a Cadenhead’s Whisky Shop. Sort of like Apple products maybe? There are Cadenhead shops spread about Europe, but in this post I will be talking about the best one. 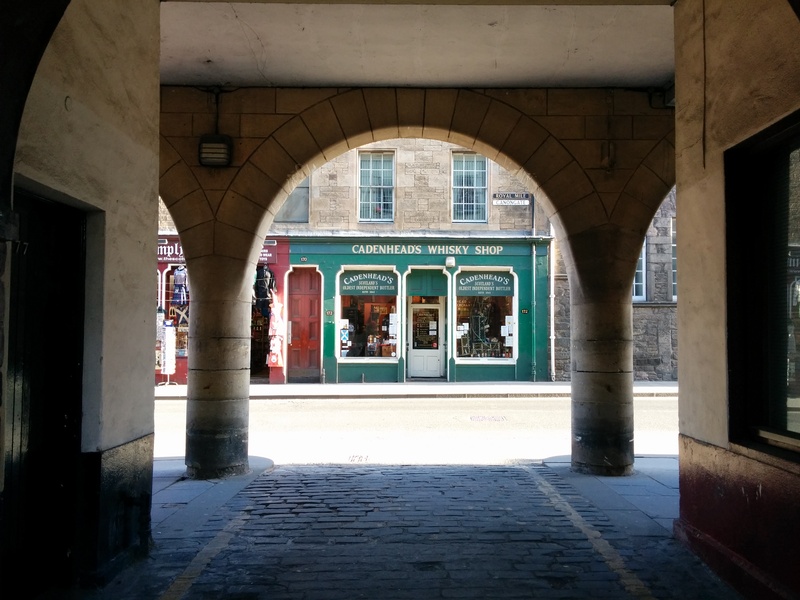 Edinburgh’s Cadenhead’s Shop. Ok well admittedly I haven’t been to the others but I can’t imagine them being any better than this. This little shop carries some of the most diverse and entertaining selections of whisky in the world. They also have live casks in the shop from which you can purchase some excellent whisky for excellent value. They also carry non-whisky spirits such as rum, gin, and brandy. Actually they were more known for rum back in the day and some of the old guard are still shocked to find that they carry anything else. If you know me, then you’ll know I am all about good cheap food! All about that. And now I shall brag a bit about my birthplace of Los Angeles. It is probably one of the best places in the world to find all types of cuisine from all around the world at a cheap price and with authentic flavour. Or just awesome flavour. Anyway, the point of this brag session is to demonstrate my good cheap food instincts. With these instincts I have deducted that, in general, food in Edinburgh is expensive and also does not rank too well among other international cities (this view point is my own but has been corroborated by some knowledgeable peoples). However, there are of course shining exceptions to this rule. Oink is one of them. The University of Edinburgh Water of Life Society (abbreviated WOLS or EUWOLS) was founded in 1988 as a student whisky society. If you are wondering why it is called the “Water of Life Society”, it comes from uisge beatha which is the Gaelic term for whisky and roughly translates to “water of life”. However, I will admit that the name is quite confusing and very few people immediately associate the name with whisky. As it stands today, the society operates tastings during the academic year (Sept-Dec and Jan-April). 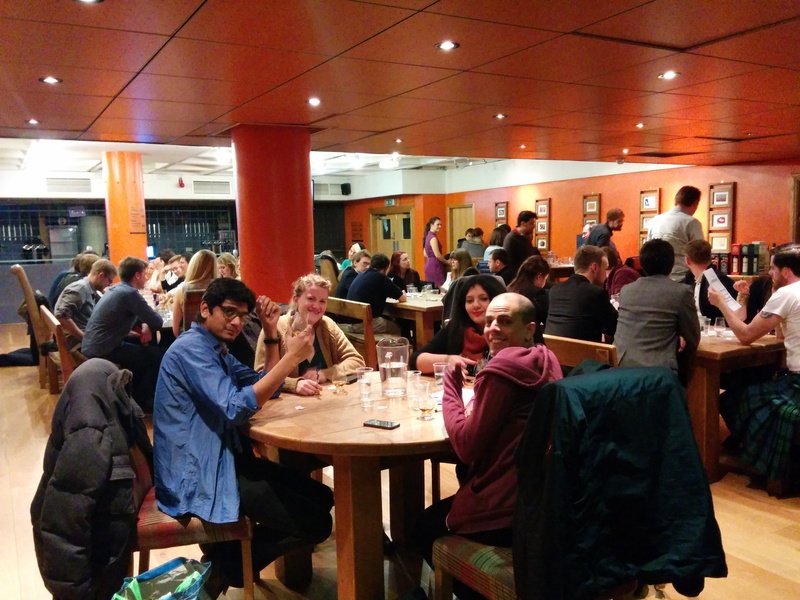 Tastings are typically held on Thursday evenings on campus at either the Potterrow Dome or the Teviot Dining Room. The size of the tastings can vary quite a bit depending on the event. General events attract anywhere from 50-100 people, while special events are usually capped at about 30 people. Usually the largest tastings occur at the beginning of the semesters with the first one of the academic year usually being the largest. There is a society website which contains some general information about the current committee but for information on future events you need to either follow the facebook group or sign up for the mailing list. I admit that I am biased here as I served on the committee for 2 years but I really do think this is a great whisky society. The tastings provide a very different type of tasting experience in that the size makes it more of a social event which is good because there are a lot of interesting people to meet. You do not need to be a student or member to attend the tastings but you get a discount on the tastings if pay for membership. I really think this is one of the best kept secrets in Edinburgh. Actually a great deal of alumni have told me that they never knew that the society existed until way after they had graduated. Despite going under the radar for many students the society is quite large with more than 1000 facebook followers and nearly 200 active members. If you are interested in the society and have questions, you can contact them via email (euwols@gmail.com). There are undoubtedly a sea of whisky tastings on offer in and around Edinburgh. Most of them are designed for tourists that have never had whisky before or very rarely. The touristy ones typically go through the standard expressions from the big name distilleries. The kind of stuff you can find at most places that sell whisky. I think these are great for beginners who want a classic introduction to whisky but if you are interested in something a bit more unique, I highly recommend going to a Jolly Toper Tasting. The Jolly Toper Tastings are run by Mark Davidson, who was the manager of the Cadenhead’s Whisky Shop in Edinburgh for many years and now manages the Royal Mile Whiskies shop up the road on High Street (the street leading to the castle). Mark has an unimaginable wealth of knowledge on whisky and whisky history and focuses on providing unique tastings with whiskies that you are not likely to find at your local whisky shop (unless you live in Scotland). While his tastings are usually attended by well seasoned whisky drinkers, he makes it a point to have them open and inviting for beginners. His tastings are usually held at the Kilderkin which is a right decent whisky bar at the end of High Street nearish to the Holyrood Palace. However, he occasionally offers tastings that are held on barges in the union canal or features a walkabout Edinburgh.